Published: Nov. 21, 2014 at 04:38 p.m. Updated: May 25, 2016 at 03:39 p.m.
1. 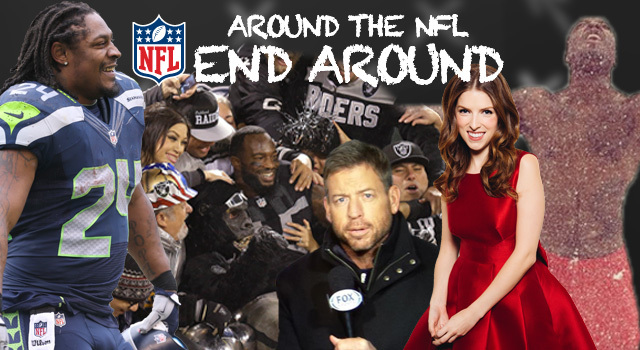 Daaaaa Raiiiiidahs: The Silver & Black ended a 52-week winless streak in style, taking down a first-place team in prime time. It's days like this that I think of Scar. 2. Josh Gordon: The NFL's leading receiver in 2013 is off his suspension and plans to "tear this league up." Just as long as you celebrate with soda pop afterward, pal. 3. LeGarrette Blount: Blount got himself cut from the Steelers thanks to some high-grade petulance, but he ended up reuniting with the hottest team in the AFC. I wouldn't quite call this a lesson learned. 1. Dwayne Gratz: The reserve Jaguars cornerback was arrested early Sunday morning and cited for disorderly intoxication and trespassing after he tried to make a purchase at a convenience store with chewing gum. This is what you kids get for drinking Fireball. 2. Jonas Gray: The Patriots running back was having a great week until his iPhone died, his alarm didn't go off and he slept through practice on Friday. Yes, your fantasy sleeper was done in by sleep. Jeez, when did Western New York become a real-life version of The Day After Tomorrow? On a related note, how many Bills fans will make it to Detroit for Monday's rescheduled "home game" against the Jets? I say whoever digs out and attends should go straight into the team's Ring Of Honor. Can't wait until this is a "C'mon Man!" segment and Mike Ditka has to pretend he knows what Twitter is. Broncos wide receiver Emmanuel Sanders took one of the nastiest licks of the season on Sunday, a shot that ended his day with a concussion. Because the internet is a wicked place, someone changed Sanders' Wikipedia page to read that he had perished on the field in St. Louis. Showing a sense of humor, Sanders spent the rest of the week proving how very alive he remains. I'm a big fan of the Random Mom in the Peyton Manning jersey. What is she doing at this club? OK, it's probably not a club, but let's pretend. It really does look like they were battling T-800s all weekend! Either that or they came straight to the stadium from their George Michael tribute band gig. I'm absolutely positive Joe Buck knows every word to "Freedom '90." Troy handles vox on "Father Figure." "Family members get to see you play. Ex-girlfriends, they wish they wouldn't have dumped you." Ravens wide receiver Steve Smith, on the enduring appeal of playing on Monday Night Football. The Seahawks running back (well, he's a Seahawks running back for another few months anyway) returned the wallet of a Seattle-area man who dropped it at a gas station. Opening your front door to the sight of Beast Mode holding your billfold is an all-time WTF moment. OK, so I was all set to bury that Saints fan who stole the football away from the lady in the Bengals jersey. I was truly looking forward to it. The #BURN would be felt in the Bayou. Then I heard what the fan, 70-year-old Tony Williams, had to say. "I really wasn't intending to hurt anyone, do anyone harm," said Williams, a loyal Saints season-ticket holder since 1970. "My motive was to keep the football for my grandbaby." "Believe me, with me, chivalry is not dead. I love my wife. I love my daughter. That hurts me a lot." Here at the End Around, we're giving Tony Williams an Official Fan Pardon. At the 1:07 mark of the above video, you'll see Clay Matthews get the sleeves of his jacket torn off by some Packers teammates. It's a scene from Pitch Perfect 2, which we can only hope features plenty of acapella from All-Pro outside linebackers. While we're here, Pitch Perfect is an example of a movie I got roped into by my wife and ended up secretly liking. She won't even find this out until she reads this column. So there it is, darling. I kind of liked The Notebook, too, especially when the two old farts croaked together in bed. I'm a sucker for dunderheaded symbolism. ANYWAY, I asked Twitter followers for their choice for the Chick Flick You're Secretly In On (CFYSIO). Here are some of your answers, with my comments in parentheses. @DanHanzus Not a movie, but Gilmore Girls is a pretty solid TV show. @DanHanzus Moulin Rouge. Still love it. @DanHanzus Must be "The Notebook". @DanHanzus Bet there's a lot of votes for Magic Mike. Lotta dudes like that flick. @DanHanzus Pitch Perfect turned out to be aca-awesome. @DanHanzus Fried Green Tomatoes. No shame at all. @DanHanzus About a Boy...... "I'M BLOODY IBIZA!!" @DanHanzus the original Endless Love. Can't deny that it was a good movie.